I love helping friends with their DIYs. DIYs always give that special touch to every event and for an event as intimate as a wedding, for me DIYs are a must (specially for us Filipinos). This can be stressful for some, but for others, this can be very rewarding and a great time to bond. When my friend asked my help to do a décor for their wedding stage (stressing already that they don’t have a budget) I was excited and ready for the challenge. We decided to play with paper. I always love working with paper. I think they can be elegant if used properly. It is easy to cut, to fold—to print on, you can really do a lot from it. First stop, I googled some possible inspirations. We came across some butterfly cut-outs and the bride liked it. 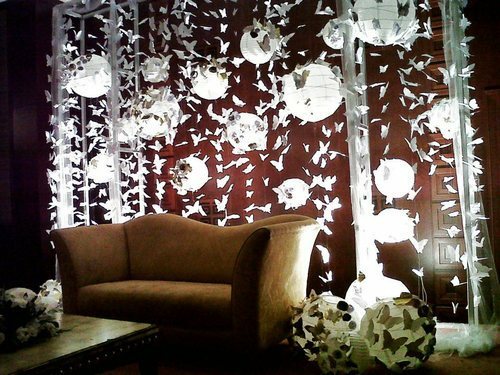 So, we thought of creating a curtain full of white paper butterflies. We hanged them on a metallic divider owned by the groom using transparent nylons. We also thought of creating flowers from paper. Somehow we figured out how to make paper roses (just cut a square paper spirally). We glued them on paper lantern balls we bought from IKEA and decided to hang them along with the butterflies to create some depth and leveling. 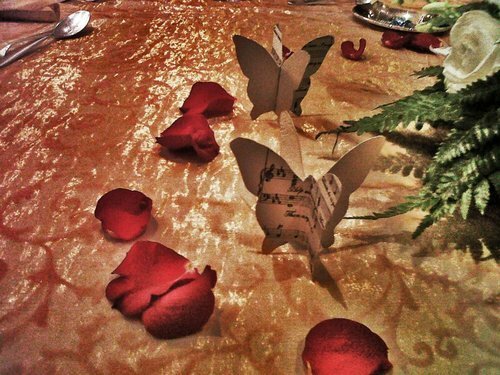 Lastly, with the butterfly still in mind, we thought of creating some table accents. 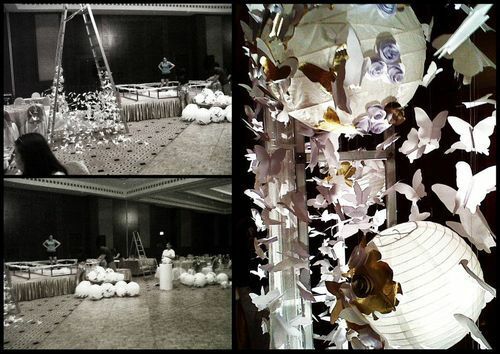 We printed musical notes (because the bride is a singer) on a brown/cream cardboard and cut it in varying butterfly shapes (same as the white butterflies), then we glued two together and folded both wings opposite one another for it to stand. 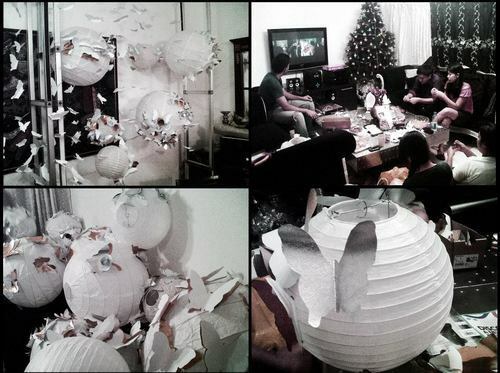 We were all happy on the outcome of our simple paper project. 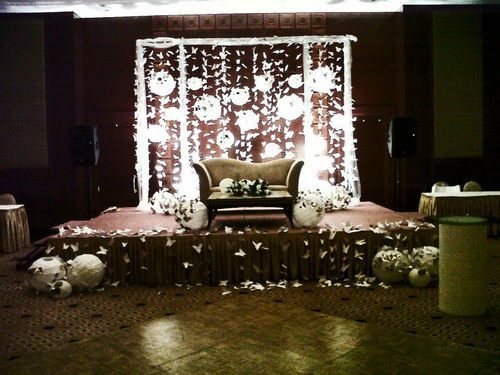 I love how all the couple’s friends pull together just to help them decorate their wedding stage.